Lately, I have been noticing more and more how much our actions are effecting our kids. The other day Harper had an empty plastic food container that could not be recycled and I asked her to throw it in the trash. She just looked at me and said, "But we could reuse it for something else." I like the way you think little girl! Miller loves helping around the house and one of his favorite things to do is put food scraps in the compost bin. Of course, he also adds sticks and anything else he feels like throwing in too, but that is not the point. I love that the word compost is part of his vocabulary at the age of 2. 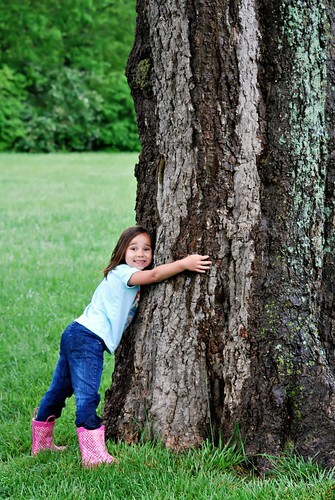 It is so rewarding to see our little tree huggers in action!! These are such cute photos! I've sooo been meaning to do this with my son (hug a tree). Thanks for the reminder I just wrote it on my list. ;) Your photo's rock!! You are clearly doing a great job raising conscientious little people! Love Harper's expression makes me smile. I love how our children pick up on the things that are important to us. You're doing a great job! LOVE it! Emma always flips the container over and if she doesn't see a recycle # on it, she acts so indignant - "You mean they didn't make this so you could recycle it, Mama?!" So funny. It has taken me 20 years to become a good enviro-citizen, though. So I hope it is just second nature with our kids! 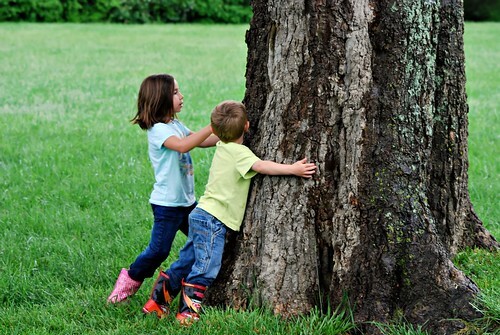 "Hey kids, go hug the tree for me would ya?" How cute! And thanks for raising more tree huggers! I know this sounds cheesy but this entry made me cry! So inspirational! You are an awesome mom - keep up the great work!